I love it. Washes great. Fits in washer. Perfect weight for summers (which basically is year round for me in Florida) It doesn’t get damage with dogs that insist on laying on it. Very pleased. Update the look of your bedroom with this lovely 3-piece quilt set. The quilt features a lovely solid white color and is made of incredibly durable and comfortable cotton material. Available in various sizes, this piece is reversible for increased longevity and available in various sizes, so you can make sure to find the perfect set for your bedroom. Tommy Bahama does not disappoint. This is a great quality cotton coverlet/bedspread for summer or winter with a blanket. The queen size fits a queen bed nicely, just enough over-hang on the bed to still see the bed skirt. The 2 pillow shams fit a full/fluffy 26" pillow (as shown in the picture). There is a technical issue with the back of the shams, when you put a full/fluffy 26" pillow (as shown in the picture), the material feels a little flimsy, I thought for a moment it may rip, but it didn't. Also, the panels on the back do not come together all the way, it didn't bother me, but was noticeable enough to mention it, in case it would bother you. This set is great in my guest bedroom. Thick and well made (except the backing on the shams is thin). Not exactly an exciting piece but looks crisp and clean. Note that the fill is not 100% cotton; somehow I missed that detail. It looks like it will last a long time. Nice material but not the size stated for king but the pillow shams can’t be used because to long. I have ordered other sets from overstock n fine but these are 41” long each. The quilt is a few inches short. Not soft at all and looks cheap. 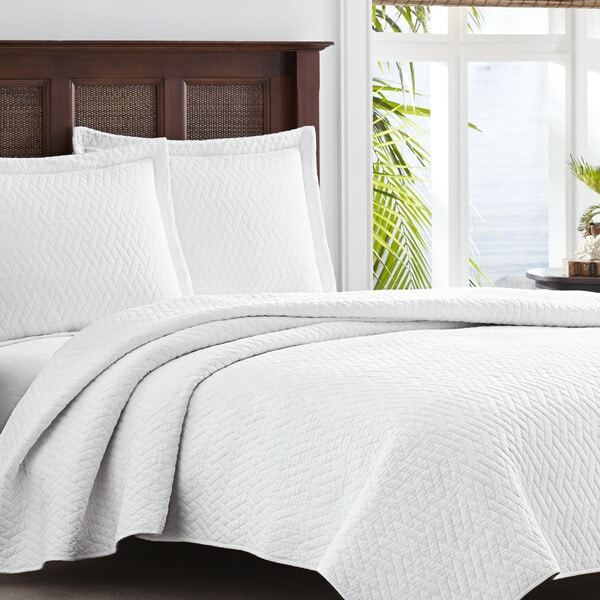 This quilt set is perfect for Florida summers. It looks fresh and clean and is nice and light. Shrunk a bit after washing but not too bad. I loved it for a couple weeks. It looked so nice in my room.I do not have a super deep mattress, 12-13" I would guess, so it covered barely. One day I noticed 2 yellow spots on it and washed it on cold as directed. It required a couple of washes and I had to use bleach on those spots, but it came out. When I put it on the bed it shrank, a lot, even washed in cold as directed on the label. They should have pre-shrunk a white quilt, it will require washing! I am so dissapointed! The new size is 83"x96" instead of what it stated it was brand new 96"x104". That is a lot of shrinkage or its original size was overstated. I love this quilt set and am happy with my purchase. The white color is beautiful and works perfect in the room. I would definitely order again. Love this quilt set, It a bright white and allows for any other color to be used in the room with it. Washes up great! The simplicity of this piece is coupled with Tommy Bahama quality for perfection! Lays nicely on our bed and tucks beautifully in our platform bed. The shams are nice and stiff enough to stand up straight! Love them. Great lightweight bedcover, shams are nice too. Item is as pictured. Seems of good quality. This quilt was just okay for me. The material is thin and it wasn’t the quality I was looking for in a Tommy Bahama product. A little disappointing, so I sent it back. Love this set!! Casual and classic, but the white gives it a more elegant look, very pleased! Washes well, and is a good thickness for summer, and just adding a thin blanket underneath makes it great in The winter too. This bedspread is Beautiful on my Bed, This bedspread comes out of the washer and dryer and still looks new. Light enough for Summer spread with just sheets and add a blanket to the bed for the winter and this is wonderful, A must buy if looking for cotton and white. I have a queen bed and bought the King and this does not go the floor, but covers the bed frame. You will not be disappointed! I really like using these blankets for my beach home. They look great on the bed. My only complaint is that it could be a little wider, it doesn't cover both sides of my 12" mattress. Just what I wanted for a guest room. This is not a heavy weight...best for warm temps. "Can you buy extra pillow cases?" Unfortunately no, additional pillowcases are not available. "Is this a bright white or a soft white color?" It is a bright white. I love it! "Is the product 100% cotton?" The cover is 100% cotton (back and front are identical) , the filling is 80% cotton, 20% polyester. Its very soft. "Can you turn the quilt sideways so that the long ways goes side to side?" Yes with the F/Q size as it is 90 x 90, other sizes are specific and will not fit other direction. "Does the sham fit a euro shaped sham?" Hello jakae, this is a standard sham that is approximately 20 inches wide x 26 inches long. The king is approximately 20 inches wide x 36 inches long. Thanks for shopping with us! "Where is this coverlet made?" Hello MD9shopper, the country of origin is China. Please let us know if you have additional questions. Thanks for shopping with us.